Procoding Mobile for iOS just got a feature-packed update: Sync with iCloud, add resources and export as self-contained HTML5 project folder. Here are some of the details. 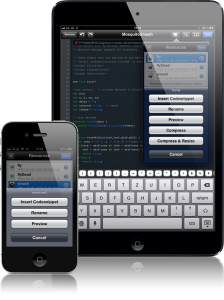 Procoding Mobile is a mobile code-sketching IDE for iPad, iPhone and iPod Touch. It gives you a simple start without having to fiddle around with multiple files. Just create a new sketch and you’re ready to code. For more information go to procoding.audiocommander.de. It comes with native support for HTML5 Canvas scripts: if you create a new Procoding sketch, you’ll get a canvas object automatically generated for you. It already takes care about screen-size, retina display, orientation and styles. Just start coding. Especially for mobile developers, Procoding comes with the advantage to code and test on the device itself. Think about Touch, Device orientation, Geolocation… all supported natively by Procoding. Procoding also comes with a some selected demo sketches to help you getting started. ➜ Add images and audio files. By adding new media resources, Procoding automatically generates and injects the relevant code. For example: use an image called “myPhoto.jpg” from your camera photo roll. Procoding adds it into the DOM tree and creates a ready-to-use variable “myPhoto”. Tap on “insert code” and your image will render. It’s easy as that. ➜ Add HTML snippets, additional divs, even CSS files along with fonts. ➜ Add additional JS code. Yes, that’s right, additional JS code. That means, you can write your own library or add any of those cool libraries around, e.g. d3.js, paper.js, … Procoding will automatically load the libraries and you can just use it. With the new iCloud support, you can code on your iPad, go to the iPhone and just pick up where you left. New in v 2.5 is also a HTML5 Export: Select the sketch and export as HTML5. There will be a folder in your document folder, that you can send to any other app or access it via iTunes. Put that folder on a server and you have your Procoding sketch as WebApp – without Procoding! Go to procoding.audiocommander.de to see the demo in action. Also, v 2.5 comes with a new design and a cleaner name. To get in touch, comment below, post to the Procoding Forum or take a look at the Procoding Facebook page. Posted on 1. March 2013 by audiocommander. This entry was posted in Articles in English, Programming, Software, Works/Werke and tagged Cocoa, Interactive, iOS, iProcessing, Mobile Phone, Objective C, PR0C0D1N6, processingjs, Procoding, Smartphones. Bookmark the permalink.